Before you do a something new do you get scared? Do you find yourself with those nervous feelings in your stomach, seems like butterflies fluttering, or a shakiness that you can’t get rid of, or thoughts of doubts racing through your head? Fear; it can strike all of us. This is an emotion that runs through our body. Fear can take over our minds and can limit us from performing at our fullest. 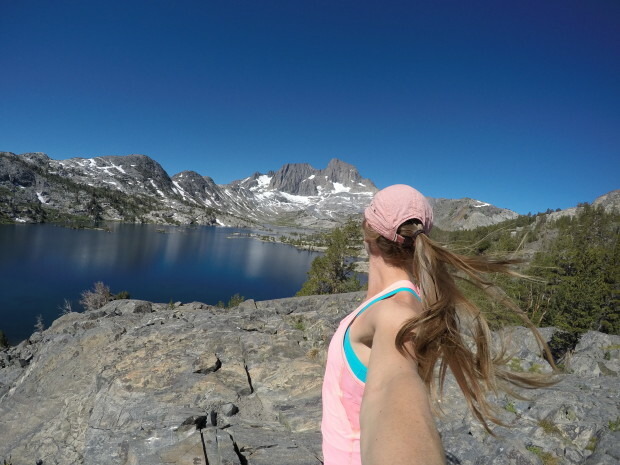 As a professional back country snowboarder and athlete, I have spent my whole career learning how to acknowledge fear, harness it, and turn it into positive energy when I am trying new things on my snowboard, in sports, or triathlons. The words used to describe me are typically fearless, confident, daring, courageous, which are all accurate; however, what people don’t recognize is that I am not always fearless. Fear is something I have learned how to manage and recognize. I have learned that mitigating risks, becoming confident with decision making and problem solving, physical training, staying in the present moment with meditation techniques, and breathing (a lot), are all ways that I can manage my levels of fear. These are tools that everyone can use. Sure, maybe I am wired differently, which allows me to push myself and control my mind more than most but I still find ways to scare myself. When I am afraid I use the tools above to bring out positive rather than negative emotions. Dropping into big mountain lines in Alaska this winter, learning new tricks; like a double backflip on a snowboard, and even doing my first olympic distance triathlon; these were all terrifying to think about initially! In order to overcome these feelings of angst I focused my mind on what I can control like; my training, my mind- with meditation, my fitness, my attitude, and just simply trying to let go of what’s happened in the past or what could happen in the future and focusing on the NOW. Fear cannot exist if you’re living in the moment (or that’s at least what I tell myself). As long as I have prepared my skills for what I want to accomplish, by putting the time and energy into training my body and mind, fear becomes less apparent. 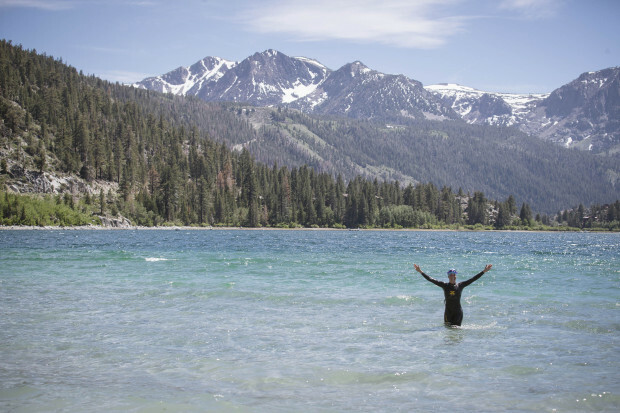 As an example of how I have managed a fear recently, this spring I set a goal to complete my first olympic distance triathlon at the June Lake Triathlon in the Eastern Sierra, which took place in the middle of July. To make it more challenging, I wanted to earn a top 3 position in my age group. I set these goals to push myself but I also had expectations because I wanted to do well. Prior to this event, I had completed a sprint distance triathlon in 2013 and ended up 1st in my age group; therefore, I knew I was capable of doing this event, now I just had to up my distances and shorten my transition times, and… learn how to swim in the open water for a mile straight, gulp. The swim is what scared me in my last triathlon and is what caused me the most anxiety in prepping for the June Lake Triathlon. The water going to be cold, wetsuits were mandatory, and the race was being held at 8000ft. The doubts ran through my head. All negatives, what ifs, and the fear that I would let myself down. Instead of caving in, I signed up for the race with confidence and I started focusing on my training. I ran, I biked, and I swam for about 8 weeks prior to the race and in between my travel schedule. I made time to meditate. I let go of my fears and embraced the challenge of doing this event with a positive attitude. When it came to race day, I was still nervous but I was excited and my main goal was to have fun! I struggled through the swim as I expected I would, made up some time on my bike, and charged full force on the run. I finished the event with a huge smile and 2nd in my age group! Fear can limit us from our goals or drive us to achieve greatness. Fear is a choice for us to live with. I have found that the more I can push myself out of my comfort zone, the more fine tuned my mind becomes. Trying new things, and not being afraid to fail help shape us into confident and courageous beings. Learning how to focus on what I can control and preparing for my goals with proper training, a present mind, and motivated spirit are what gave me the confidence to snowboard in the huge mountains in Alaska this season. I like to say I am mindfully fearless because I have taught myself how to control that scary word; Fear.